Thanks guys, its been a hard slog but the end is finally in sight with these! Cracking job, it has been great watching this come together. 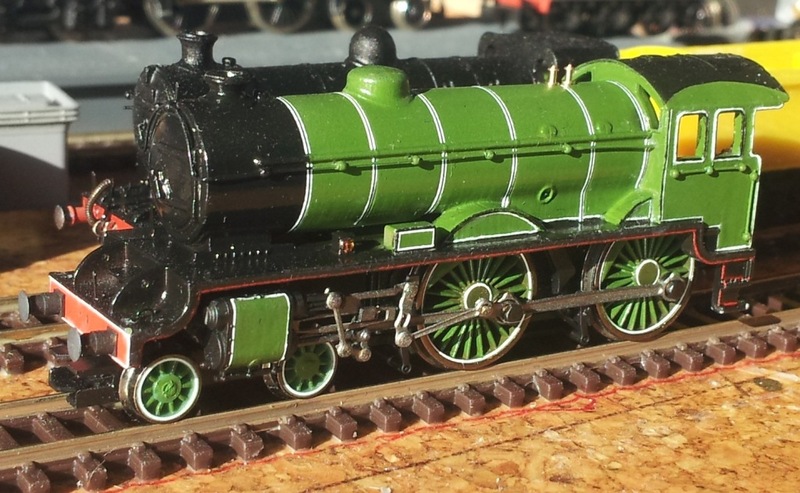 The loco is lovely in LNER green but it just looks sooooo good in BR lined black doesn't it? Wow, these models set an amazing standard! 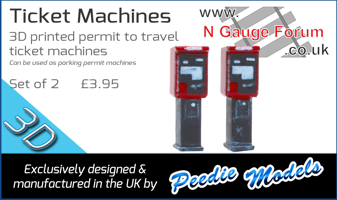 Well done - you must be justifiably very proud of them. Well I guess with regard to you guys, there is no accounting for taste! At least I've found somebody who prefers the apple green one on another forum; apparently it is epic! Thanks Mike, I'm not sure that they are an amazing standard but I do try to emulate and get as close as I can to the standards that some others achieve on here. Dr Al, The Brighton, Ozymandias and Paul Price amongst others all deserve credit with providing inspiration with their wonderful creations. Steve, you're up there with the best of them. Thanks Joe. I honestly don't feel like that most of the time, always having to fudge, bodge and rescue models! 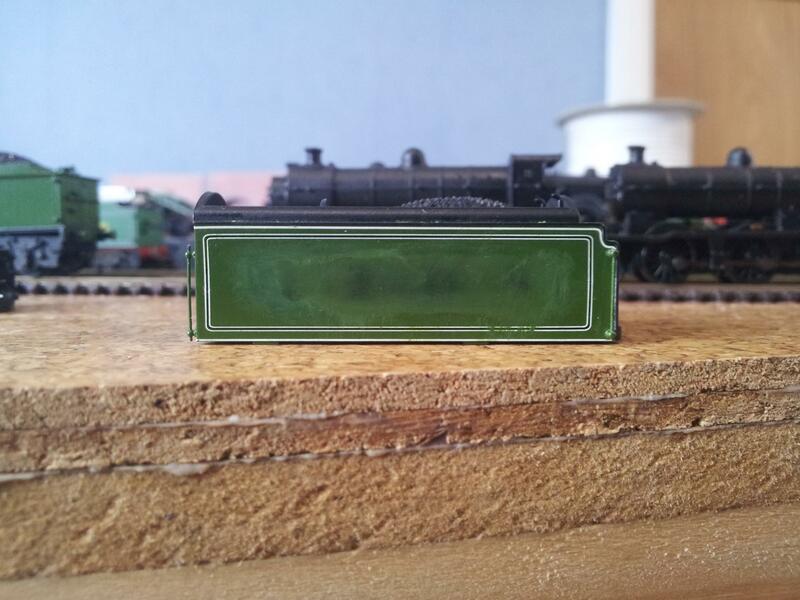 Speaking of which, having successfully remove numbers/letters from several locos, I'd had a bit of a disaster on a couple of the Dapol A3 tenders - one being my emergency backup spare! 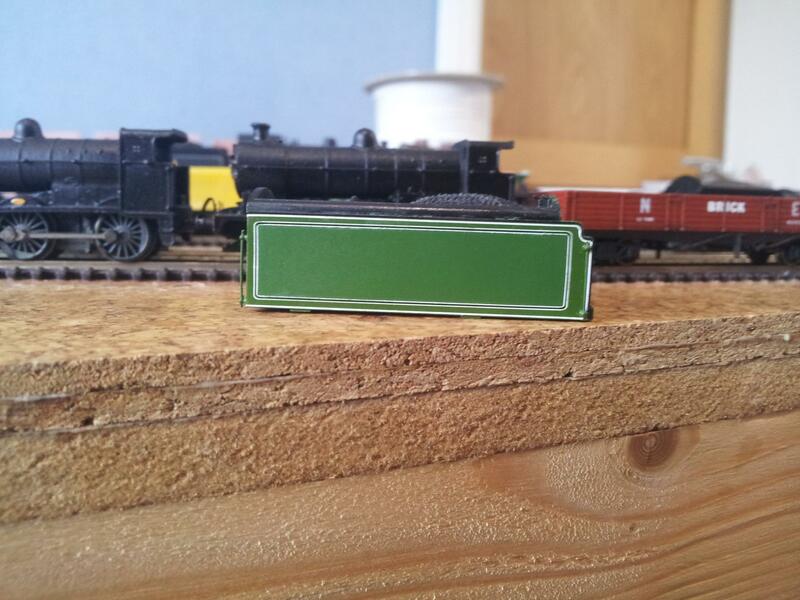 In a nutshell I'd managed to strip the paint from around the tender lettering, which isn't a problem until you realise that the correct scale lettering is much smaller than Dapol's (although the cab numbers are much closer). Therefore I thought I'd try and patch paint the affected area with a brush - big disaster! Trying to get a good enough match to simply overpaint the black areas was impossible and numerous attempts with a brush made the whole thing look messy and required me to rub the whole lot carefully down (taking some of the lining with it! grrrr!). 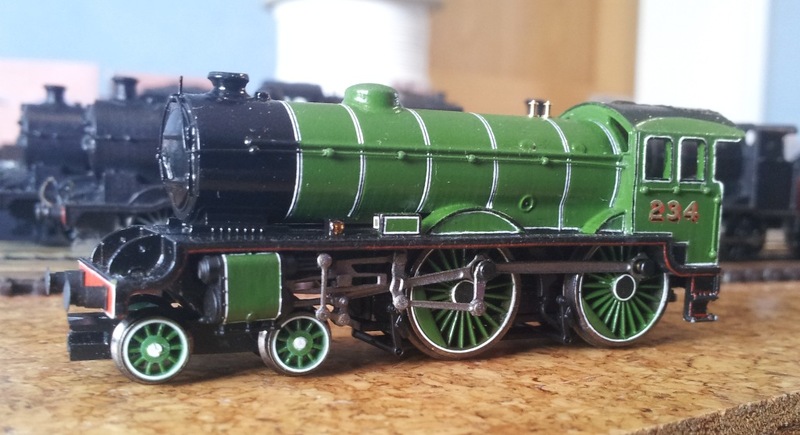 In the end the solution was to forget trying to get an exact paint match and use Precision Doncaster Green paint. The area was rubbed back down and carefully masked to preserve, as best as possible, the remaining lining before spraying the whole area using an airbrush. The paint isn't an exact match but by using the lining to separate the two shades of green, it really isn't noticeable at normal view distance and lighting conditions. However, it did cause the inner white line of the lining to become a bit thin in places so I had to re-instate it using my offset bow compass set. Overall I think it result isn't bad for a rescue job done in desperation and I'll get in with the spare tender body in due course. I didn't take a before picture of the repaired tender, but the spare (pictured below) is pretty much in the condition the repaired one started in. I need to varnish and letter the tender now and finally get on with finishing Enterprise! I think a little weathering will blend the whole lot in nicey. The key with patch painting is always to paint up to a defined edge - lining, a corner, a handrail, etc. This is a visual break for the eye and therefore any slight difference in paint pigment is not anywhere nearly as apparent. Also patch painting via a masked panel via airbrush can really be more controlled and aid just blending over the areas, and allow the minimum amount of paint necessary to be applied. Overcoating the whole surface with a uniform varnish at the end brings any differences in finish (satin, gloss or matt) together as invariably the paint will be more of less glossy than the factory finish. Dapol printing is tougher than Farish, so tends to be more difficult to remove will not damaging the underlying surface I've found - I lost a bit on my Enterprise 60111 under one number. Slow and steady is the (frustratingly arduous) way. Thanks for that Alan, hopefully it'll all be ok once I've finished it! 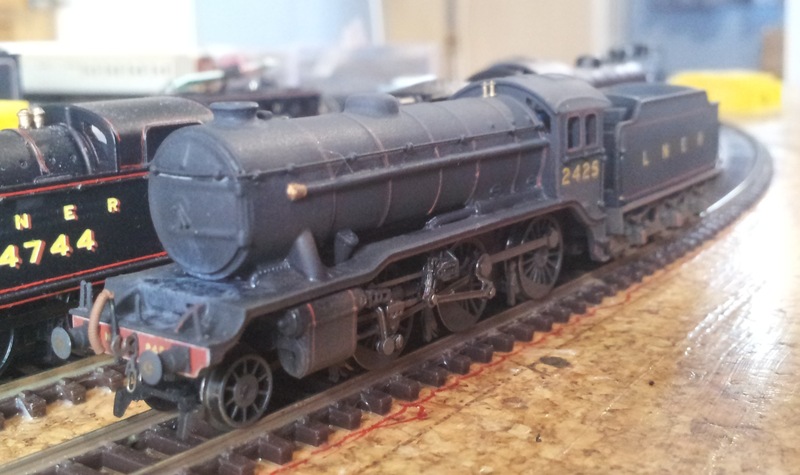 Not had a huge amount of time for modelling recently but I have progressed a little bit with the LNER D49. She's going to be Yorkshire now as I cannot find anyone who produces plates for Lincolnshire and I really want one of those lovely works plates as fitted to The Middleton (and it's a nice easy locomotive number to remember!). Anyway, current condition of 'Yorkshire' is shown below. Someone needs to have a chat with the Kings Cross cleaning crew about the state of 2425, it must have just finished a pretty intense turn to end up looking like this! 4744, just about in shot, looks spotless by comparison (although needing attention to her boiler bands!). Following a bit of a down phase again mentally, I've been experimenting with weathering and wanted to tone down the lined black on the K3. Surprisingly, I've seen photographs of 1930's locomotives that aren't far off of this but they're probably the exception rather than the rule. 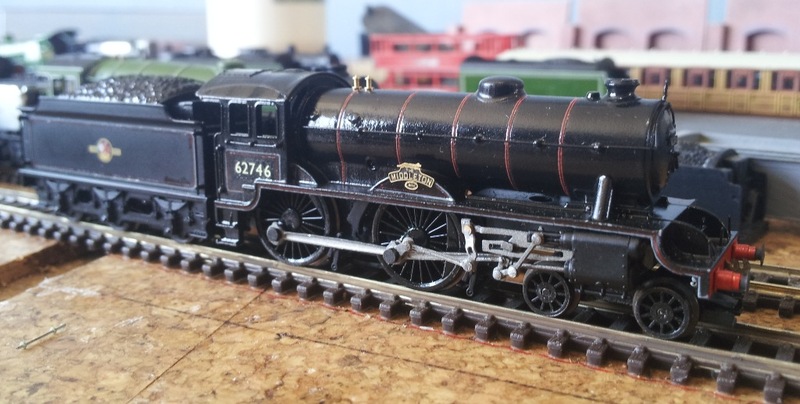 The photograph actually makes the locomotive look a little dirtier than it really is but I'm happy with this as a first serious attempt at weathering and I've learnt some things that will be useful when I weather the BR condition locomotives (assuming the owner wants me to). Light is bad now but below is a picture of Yorkshire which is just about finished cosmetically. I've still got to sort out the loco to tender connections and make it run though!